Posted on November 3, 2017 - By Fucosoft | Follow YouTube, Twitter to Get More Information. Q&A: How do I recover deleted voice memos on my iPhone? I regularly record songs that my band is working on at practice and keep them on my phone. After upgrading my iPhone 8 Plus to iOS 12, all of my voice memos are gone. Can anyone help me to recover the voice memos? I need them back!! iPhone’s built-in Voice Memos app works great to record any audio you want. It can be your favorite songs, important talks, lectures, interviews, meetings, or anything at all. 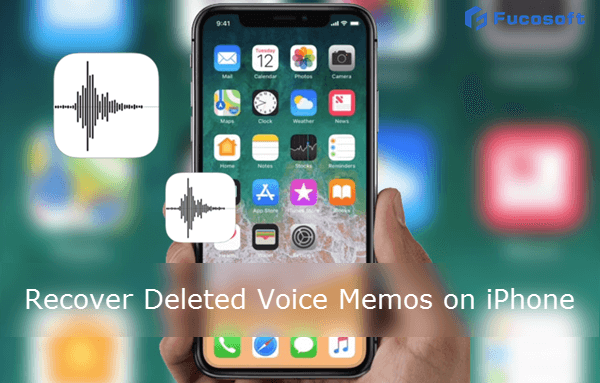 What if you have a bunch of voice memos on iPhone, but lost due to accidental deletion or iOS 12 upgrade crash? Unlike Notes, there isn’t a folder called “Recently Deleted” for deleted voice memos. However, that’s not the end. You still have ways to retrieve deleted voice memos from iPhone/iPad. Read on and check out. Apple Support provides tutorial: Restore your iPhone, iPad, or iPod touch form a backup to solve this issue. Provided that you have backed up your iPhone to iTunes or iCloud after creating voice memos, congratulations, you can fully restore your iPhone to get them back. However, you should note that you can’t preview or selectively recover voice memos. Beyond that, all your existed data like photos and videos will be erased and replaced by the data on the backups. Another way to retrieve deleted voice memos from iPhone is using third-party recovery tool – Fucosoft iPhone Data Recovery. It helps you retrieve deleted voice memos directly from iPhone, or extract from iTunes/iCloud backup. This software fully compatible with iPhone XS, iPhone XS Max, iPhone XR, iPhone X, iPhone 8/8 Plus, iPhone 7/7 Plus, iPhone 6s/6s Plus, iPad Pro, iPad Air, etc (iOS 12 supported). Get iPhone Voice Memo Recovery and install it on your computer. Then connect your iPhone to the computer via USB. Run the program and follow the instructions as show on the screen to scan your iPhone for deleted voice memos. Once the scan is complete, preview the found voice memos and select the items you want, then recover them to your computer. That’s all. It is quite simple to recover deleted voice memos on iPhone with Fucosoft iPhone Recovery software. Besides, you can recover deleted notes on iPhone, as well as voicemail, calendar, Reminders, Safari history, WhatsApp, Viber, Kik, text messages, contacts, call history, photos, videos and more.